If you haven’t noticed, I like to brew big beers to celebrate the changing of seasons. 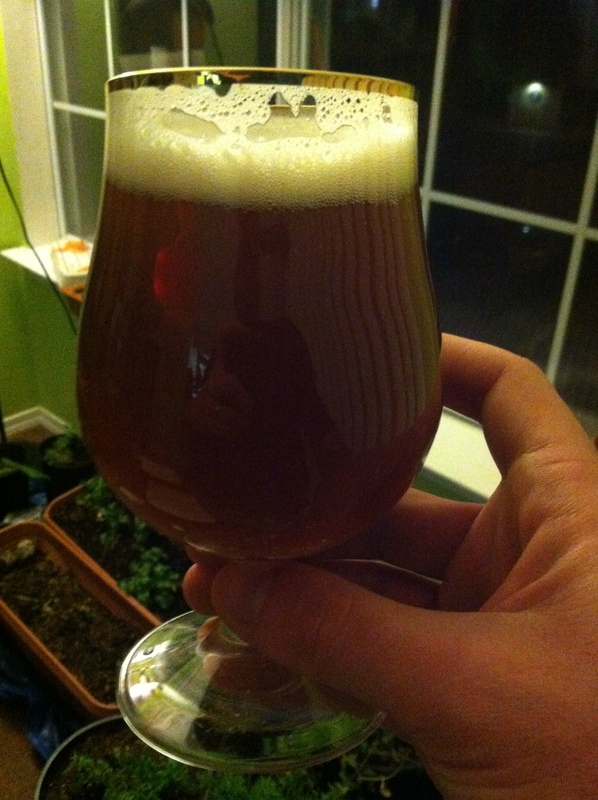 For the 2013 summer solstice, I brewed a big English-style barleywine with a twist: using only Maris Otter malt. Hence Blonde Barleywine! After aging for 6 months in bottle (fairly young for a barleywine), I gave this one a taste. As you can see in the picture, the color of this barleywine came out much darked than expected, amber with a foamy, white head. My guess is that an extended boil to condense the wort from 5 to 3 gallons really pushed this blonde-ish beer from a predicted 6 SRM into the 10s. In smelling, mainly a fruity amoma with some malt, likely from the British Ale yeast being pushed to its alcohol tolerance. Amoma carries through well in the flavor, dark fruits with some sweet malt. Also some earthiness is appearence likely from the EKG hops; bitterness comes across as balanced. No oxidation is appearant (yet!). After tasting, I would summarize my overall impression as if you crossed a traditional English barleywine and Belgian triple, which is to be expected as both recipes share many similiarities. This one will be exciting to taste in future years. Try this recipe for something different!